Have you been missing the chicken in your chicken nuggets lately? At Rich Chicks we don’t add fillers, binders, artificial colors or flavors to our whole muscle Boneless Chicken Wing / breast chunks. We stick to the basics, real whole muscle chicken breast chunks, whole grain breaded with ingredients you recognize and trust (and can pronounce). Rich Chicks, unrivaled quality, Rich in Flavor, Rich in Nutrition. It’s game day and you’ve got 5 friends showing up to your place in an hour. No time for long recipes and grocery store runs, no worries. 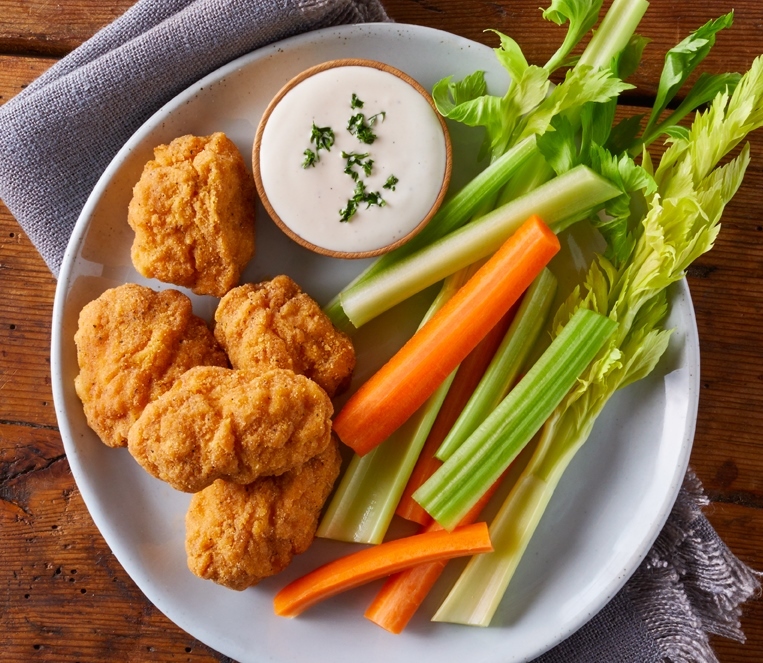 Pop Rich Chicks Premium Gourmet Whole Grain Breaded Boneless Chicken Wings into the oven, set out your favorite dipping sauce selection, sit back and relax. Make sure to garnish the plate with some celery and carrots, your friends will need something to snack on when all the Rich Chicks is gone. Build, enjoy, repeat. Rich Chicks, it’s what’s for lunch, or dinner, or whenever! Convection Oven: Bake at 375°F for 8-10 minutes. Conventional Oven: Bake at 375°F for 10-12 minutes. Chicken Breast with Rib Meat, Chicken Protein Solution (Water, Chicken Protein), Water, Whole Wheat Flour, Enriched Wheat Flour (Wheat Flour, Niacin, Reduced Iron, Thiamine Mononitrate, Riboflavin, Folic Acid), Oat Isolate, Salt,Leavening (Sodium Bicarbonate, Sodium Aluminum Phosphate), Spices, Garlic Powder, Hydrolyzed Wheat Gluten Protein, Soybean Oil (as a Processing Aid), Ascorbic Acid, Soy Flour, Extractives of Paprika, Natural Flavors. Breaded and Battered with: Whole Wheat Flour, Enriched Wheat Flour (Enriched with Niacin, Reduced Iron, Thiamine Mononitrate, Riboflavin, Folic Acid),Water, Salt, Yellow Corn Flour, Leavening (Sodium Bicarbonate, Sodium Aluminum Phosphate), Soybean Oil (As a Processing Aid), Garlic Powder, Hydrolyzed Wheat Gluten Protein, Black Pepper, Egg Whites, Ascorbic Acid, Soy Flour, Extractives of Paprika, Natural Flavors, Spice Extractive, Cellulose Gum.